King of Spain; born 1452; died 1516; son of Juan II. of Aragon by his second wife, Juana Enriquez, daughter of Fredrique Enriquez, admiral of Castile, and granddaughter of the beautiful Jewess Paloma of Toledo. While still heir to the throne Ferdinand had friendly dealings with many Maranos. His marriage with the much-admired Isabella of Castile was materially furthered by Jews and Maranos on the supposition that he, himself of Jewish descent on his mother's side, would prove, like his father, benevolent toward the Jews. Abraham Senior of Segovia, the chief farmer of the taxes, was specially concerned. He had the young Ferdinand come secretly to Toledo, although this afterward directed against him the opposition of a part of the Castilian nobility. In Monzon Ferdinand had to borrow twenty thousand sueldos from his "beloved" Yayme Ram, who was the son of a rabbi and one of the most important jurists of his time. Pedro de la Caballeria, a very rich and respected Marano of Saragossa, was called upon to win over the Archbishop of Toledo, Pedro Gonzalez de Mendoza, the Bishop of Siguenza (later Primate of Spain), and others, to this marriage of Ferdinand, and the bridal gift, a costly necklace worth 40,000 ducats, was paid for largely by him. Yayme de la Caballeria, son of Don Bonafos, was the trusted friend of Ferdinand, and accompanied him on his first journey to Naples. Miguel de Almazan and Gaspar de Barrachina, son of Abiatar Xamos, were his privatesecretaries; the Maranos Gabriel and Alfonso Sanchez, his treasurers. He made Francisco Sanchez his majordomo, and raised Francisco Gurrea, son-in-law of Gabriel Sanchez, to the position of governor of Aragon. As King of Aragon he had recourse to the Santangels when in need of money. Ferdinand wrapped himself in a mantle of piety. The introduction of the Spanish Inquisition, and the subsequent banishment of the Jews from Spain, although decreed by the royal pair, were chiefly the result of Ferdinand's work. Isabella the Catholic, Ferdinand's wife (b. 1451; d. 1504), was also surrounded by baptized Jews or their sons. Her confidential advisers and secretaries were Fernando Alvarez de Toledo, whose descendants bore the title of Count of Cedillo, and Fernando del Pulgar, author of a history of the reign of Ferdinand and Isabella. Pulgar openly defended his coreligionists and approved neither of the expulsion of the Jews nor of the institution of the Inquisition. The queen's confessor, Fernando de Talavera, was of Jewish descent on his mother's side, and was persecuted as a Marano by the Inquisition despite his high office. 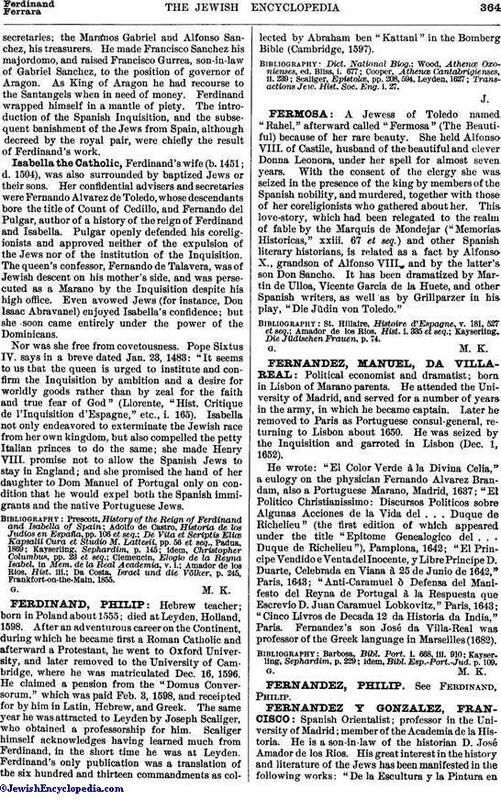 Even avowed Jews (for instance, Don Isaac Abravanel) enjoyed Isabella's confidence; but she soon came entirely under the power of the Dominicans. Nor was she free from covetousness. Pope Sixtus IV. says in a breve dated Jan. 23, 1483: "It seems to us that the queen is urged to institute and confirm the Inquisition by ambition and a desire for worldly goods rather than by zeal for the faith and true fear of God" (Llorente, "Hist. Critique de l'Inquisition d'Espagne," etc., i. 165). Isabella not only endeavored to exterminate the Jewish race from her own kingdom, but also compelled the petty Italian princes to do the same; she made Henry VIII. 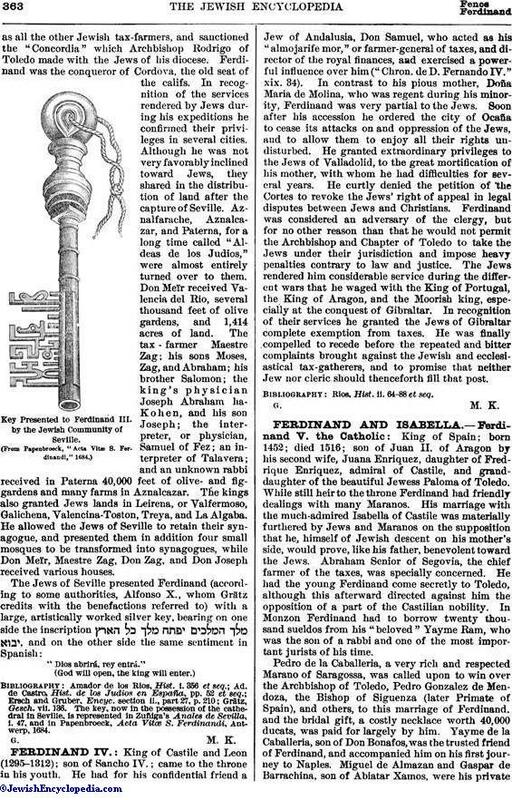 promise not to allow the Spanish Jews to stay in England; and she promised the hand of her daughter to Dom Manuel of Portugal only on condition that he would expel both the Spanish immigrants and the native Portuguese Jews. Da Costa, Israel und die Völker, p. 245, Frankfort-on-the-Main, 1855.